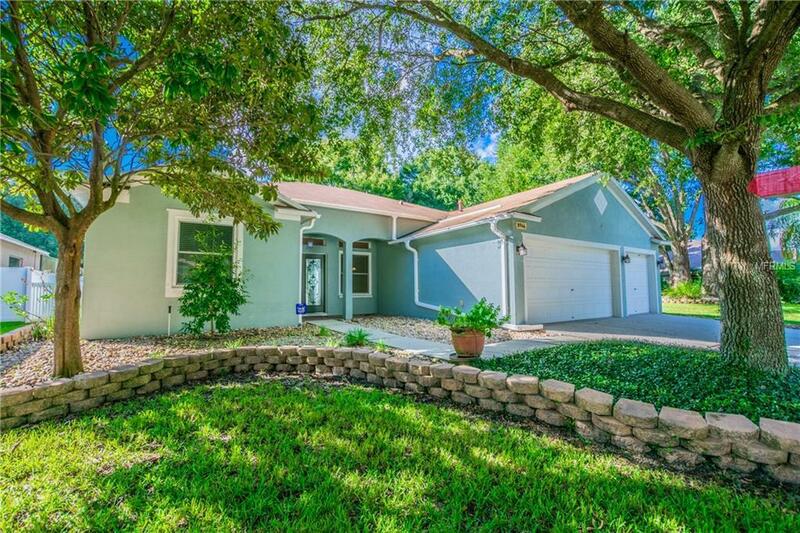 LOOKING FOR A PERFECT HOME, YOU DON'T NEED TO LOOK FURTHER, THIS BEAUTY WITH 4 BEDROOM/3 BATHS IS LOCATED IN ABERDEEN CREEK, RIVERVIEW, ONE AND A HALF LOT EQUALING ALMOST 1/2 ACRE IN THIS COMMUNITY, WITHIN A MILE OF A PUBLIC BOAT LAUNCH WITH ACCESS TO ALAFIA RIVER AND TAMPA BAY. ENTER THIS SPACIOUS HOME THROUGH STAINED GLASS DOORS, THE LIVING ROOM, FAMILY ROOM AND MASTER BEDROOM ALL LEAD TO THE BEAUTIFUL POOL AREA, DRINKING COFFEE WHILE ENJOYING THE BEAUTY OF THE MAINTAINED BACK YARD. MASTER BEDROOM FEATURES 2 WALK IN CLOSETS, FRENCH DOORS TOWARDS THE POOL AREA. MASTER BATHROOM WITH 2 VANITIES, WALK-IN BATH TUB, WALK IN SHOWER. 2ND, 3RD BEDROOM CARPET FLOORING, 4TH BEDROOM WITH LAMINATE FLOORNG. 2ND BATHROOM WITH TUB . 3RD BATHROOM WITH TUB CLOSE TO BACKYARD FOR YOUR CONVENIENCE. SPACIOUS KITCHEN WITH NEWER STAINLESS STEEL APPLIANCES, 42" CABINETS, ISLAND, CORIAN COUNTERTOPS AND LOTS OF CABINET SPACE. WATERHEATER APRIL 2016. A/C 2014. HURRICANE WINDOWS THROUGHOUT , HURRICANE METAL SCREENS FOR ALL DOORS. SOLAR SYSTEM FOR POOL, 3RD CAR GARAGE HAS BEEN CONVERTED WITH A/C FOR ADDITIONAL STORAGE OR A HOME GYM. (CAN BE EASILY CONVERTED BACK). BACKYARD FENCED IN WITH OLIVE, MEYER LEMON, ORANGE NAVEL, FIG TREES, A WELL FOR POOL AND GRASS. BEAUTIFULLY LANDSCAPED. WTH A BIG UTILITY SHED FOR EVEN MORE STORAGE. EASY ACCESS TO BRANDON, CLEARWATER, ST. PETE BEACH, TAMPA AIRPORT, GREAT SHOPPING, DINING, MEDICAL FACILITIES, MALLS, AWARD WINNING BEACHES. WELCOME TO PARADISE. CALL TODAY FOR AN APPOINTMENT.